My Granddaddy hated the Tennessee Volunteers. Like, with the fire of a thousand suns, hated them. In fact that was one of the few things everyone in the state of Alabama, whether Tide or Tiger fans, could all agree on; their complete and utter loathing for the checkerboard. Until I was probably nine years old, I thought Vols had to be preceded with, well, a word I can’t say here. After arriving in Gainesville, it didn’t strike me as odd that the Florida Gators felt the same way about Tennessee, because it seemed natural that so many SEC teams would focus a sense of repugnance upon this one other team. For many current players on the Gators roster, this has always been the way of life as well. 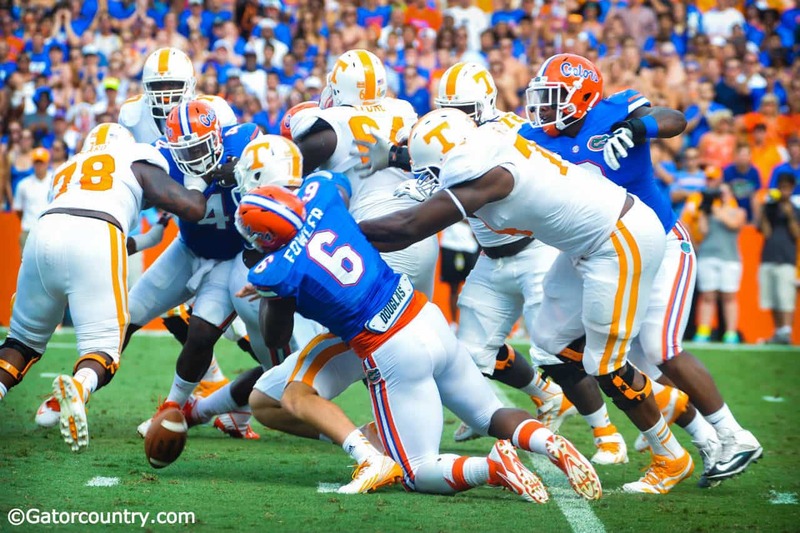 Dante Fowler Jr sacks the Tennessee quarterback / Gator Country photo by David Bowie. Redshirt junior Marcus Maye, who was born in 1993, recalls being introduced to the game in the most likely of places. Redshirt sophomore Jordan Sherit, born in 1994, got much the same introduction. Both can agree that there’s a whole new level of intensity once you become apart of the rivalry itself. “As far as just being apart of it now, makes it a lot more interesting and you feel like it’s a must win when this game comes on,” explains Maye. “You don’t really understand it till you get here and get on campus,” says Sherit. That last comment by Sherit is what makes this rivalry interesting though—the fact that so many others long preceded it. 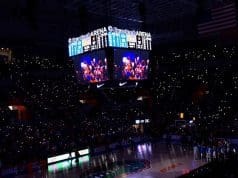 Florida versus FSU, Florida versus Georgia, for years those were, and still are, the most important rivalries for the Florida Gators. In studying history, imagine my surprise to find that this Florida versus Tennessee rivalry was fairly young in comparison. There was enough hate between the two that the rivalry mirrored those that I had always associated with Tennessee. But in actuality, it wasn’t until the 1990’s, when the players on this roster were just babes, that this rivalry really hit it’s stride. One man who was right in the thick of it all was James Bates. The linebacker straight out of Sevierville, Tennessee was an unknowing catalyst for a game that would become a marquee matchup in the SEC East. While of a member of Steve Spurrier’s squad in the mid ‘90’s, Bates had a shirt that he would wear for offseason workouts. Just a simple t-shirt that he would take a sharpie to and write the date of that year’s Florida-Tennessee game. “It was without a doubt my game,” says Bates. Growing up with parents who were both Tennessee alumni, including his father who played linebacker for the Vols, Bates was inundated with the familiar pale shade of orange from childhood. In high school, he played football only 25 minutes from Neyland Stadium. When his recruitment came around, many including his family saw it as nothing more than a formality. Surprised is an understatement. 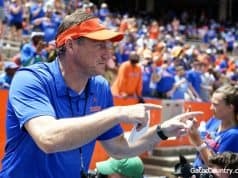 When he called his mother from Coach Spurrier’s office to let her know he had committed to “fun in the sun and fun-and-gun”, the conversation was short. She came around, he assures, even buying some Gator gear. But it was that motivation from family and friends back home that Bates brought to Gainesville with one game on his mind and his t-shirt. 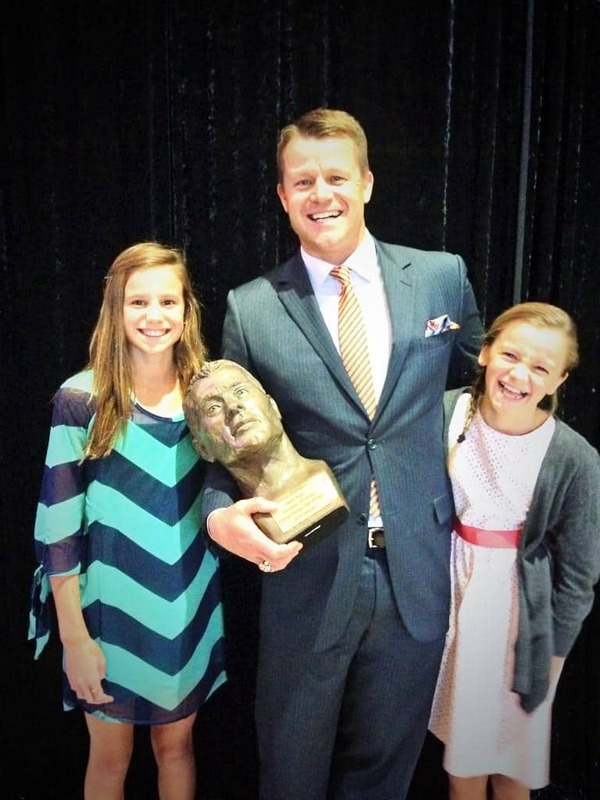 Former Gator James Bates (pictured with daughters) was inducted into the Florida Georgia Hall of Fame, but Tennessee is still favorite game. Bates is naturally infectious, with a personality that has landed him on the silver screen opposite the likes of Adam Sandler. He’s now a play-by-play announcer for Fox Sports and never meets a stranger. It might be a coincidence but it’s no surprise that not long after James became a Gator and introduced himself to fans that Tennessee became such an important game. Rankings and a newly minted split league SEC lent to the rise as well, as evident in 1995. 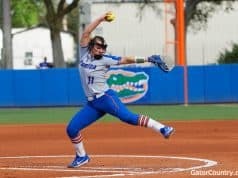 During that year, Bates’ former high school teammates and friends came to The Swamp with a Top—10 ranking next to their name. The Florida Gators won and thus set in motion a rivalry that would grow faster than Robin Williams in Jack. The fact that Florida won those four years in a row, and again the year after, would seem to contradict the argument that it was during this stretch that the two became such bitter rivals. How could a game be that important if it was always won? But “always” doesn’t mean “easily”, and that, Bates says, was the difference. This was never truer than in 1996. It was week three in Knoxville. College Gameday was on hand for what they viewed as the biggest game of the day. No. 4 Florida Gators versus No. 2 Tennessee Volunteers. Danny Wuerffel versus Peyton Manning. A chance for redemption with Manning and the Vols who were determined to not drop “this one” against the Gators. It was a perfect bounce, as Bates blitzed the future Hall of Famer, knocked the pass down and into Ed Chester, and then caught the ball when it bounced back off Chester and towards Bates. But that day (which Florida won 35-29), Bates’ entire four years as a Gator and essentially the Florida Tennessee rivalry can all be summed up in one play for Bates, and its one that saw him on the sidelines, helmet in hand to return to the field following a punt that wouldn’t happen. On the first drive of the game Florida was facing a 4th and 11 from the UT 35 and Steve Spurrier set the tone for the rest of the game. “Spurrier went for it right about midfield, and Danny hit Reidel [Anthony] on like a little slant for a touchdown and there’s so many pieces of that play that I love. But the thing I really love about it is the picture that ran in the papers the next day of Reidel because his momentum carried him like through the endzone and up the wall close to the stands and there’s this girl right behind him and all these stunned fans. I mean they have Peyton! There’s no way they’re gonna lose to the Gators this year and here we come and Spurrier, I mean that’s the biggest Spurrier move, that’s as Spurrier as you can get with that play call. To come out on top and just go stick it to them early and then we just opened up the floodgates with all the turnovers that we forced on defense. And I had an interception on Peyton and just for so many reasons, that’s probably my favorite game… to know that I went away, even though a lot of people didn’t think it was the right thing to go to [Florida], I choose to go to Florida and to make it four in a row and to know that I never lost a football game as a Gator to the University of Tennessee, that was a special day. Following the game, Florida went on to win the National Championship. The Volunteers went on to win the Citrus Bowl, and well…you know. It’s that sort of history that makes this rivalry so important to both sides. It’s the Florida Gators forever lording the fact that Peyton couldn’t beat the Gators over Vols’ heads. Even current Gator wide receiver Ahmad Fulwood still can’t fathom that fact. 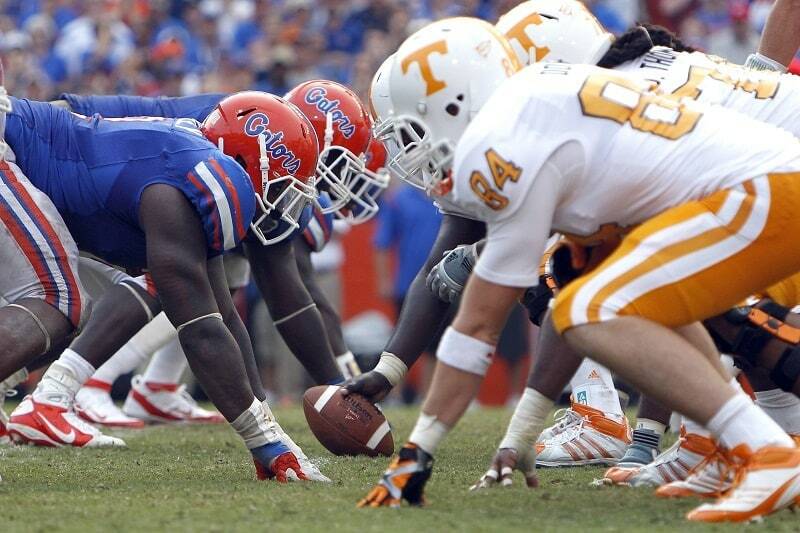 It’s the series best 10—game win streak that the Gators currently hold over the Vols. It’s Dominique Easley spending an entire press conference speaking on his hatred for Rocky Top. Even in the last three years, an Austin Hardin 49-yard field goal that whitewashed a checker boarded Neyland Stadium; a saving performance from Tyler Murphy coming in for the injured Jeff Driskel; a Darious Cummings fumble recovery that even Smokey turned away from. So many of these moments come to fruition in the game that many Gator fans consider their first true test of the season (sorry Kentucky). 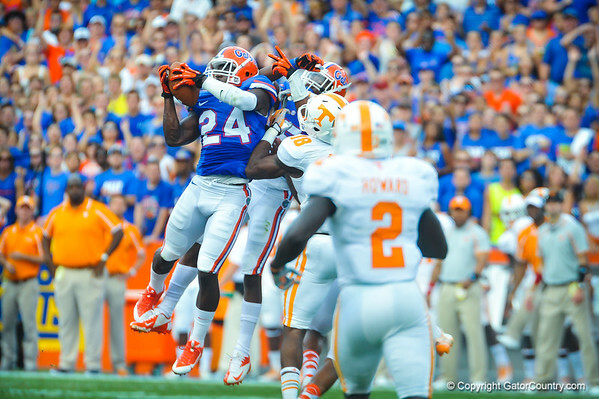 Gator DB Brian Poole leaps into the air and intercepts the ball. Gators vs Tennessee Volunteers. September 21, 2013. There’s more history in the last 25 years of Florida versus Tennessee than most rivalries could hope for in a lifetime. It’s a game that is poised to stand the test of time. Born out of league necessity, molded by the ‘90’s and grown by fans, Florida-Tennessee has come to embody the accepted hatred that can only be found surrounding the gridiron.